Reconcile Invoice and Expenses with your monthly bank statement. 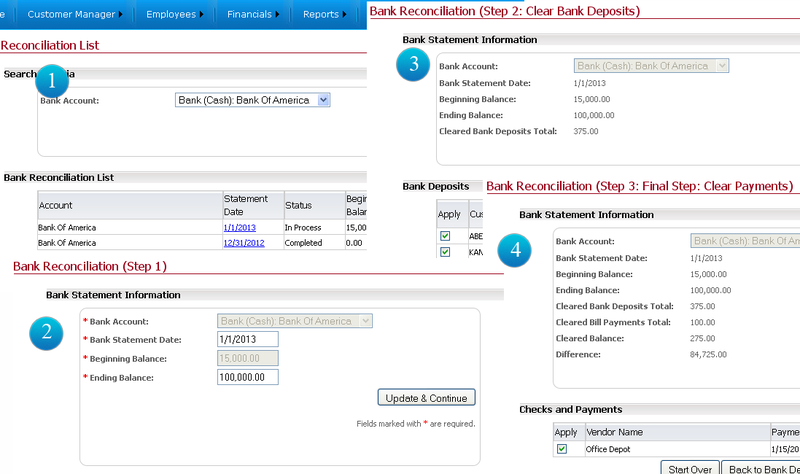 You can reconcile bank statements for multiple bank accounts that you deal with. All bank statements and it's reconciliation history is stored forever. For every bank reconciliation you enter beginning and ending balance. Beginning will be automatically populated from previous ending balance. All checks deposited or any manual journal entry that you may have entered into your bank (cash account) will be shown in this screen for you to clear. All payment or any manual journal entry that you may have made out of your bank (cash account) will be shown in this screen for you to clear.